During the Civil War and after the battle In Mobile Bay, naval historians called this gun, the 9 inch Dahlgren, "the gun that won the Civil War". 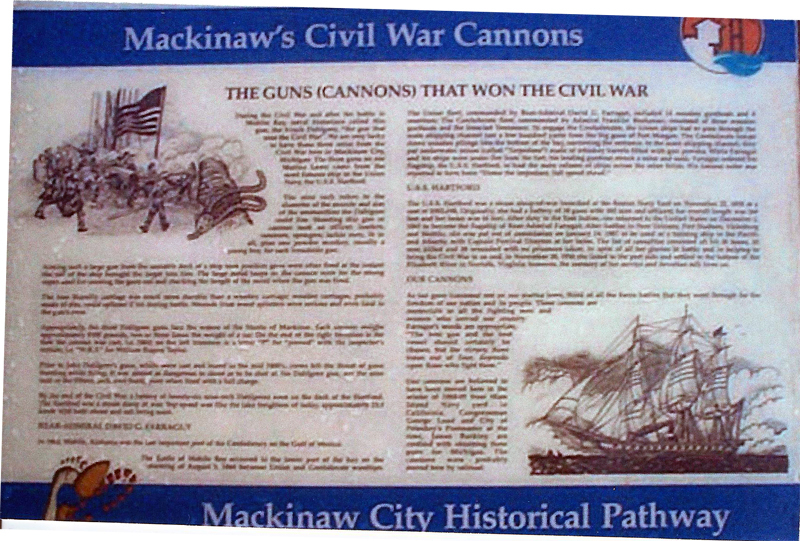 We are very lucky to have these three relics from the Civil War here in Mackinaw City, Michigan. The three guns on our Marina Lawn came from the most famous ship in the Union Navy, the U.S.S. Hartford. The nine inch refers to the diameter of the muzzle and size of the ammunition the Dahlgren could fire. Shooting this gun or cannon took an officer, leaders, rammers, spongers, tackle men, 16 in all, plus one power monkey, usually a young boy, for each broadside gun. Aiming such a large gun from the unstable deck of a ship took practice: guns were often fired at the instant the roll of the ship brought the target into line. The large metal loops on the cannon were for the strong ropes used for running the guns out and checking the length of the recoil when the gun was fired. The iron Marsilly carriage was much more durable than a wooden carriage: wooden carriages, probably made of elm, could splinter if hit during battle. Wounds from wood splinters were serious and even fatal to the gun's crew. Appropriately, the three Dahlgren guns face the waters of the Straits of Mackinaw. Each cannon weighs approximately 9300 pounds, tow or three times the weight of a car. On the end of the right trunnion is the date the cannon was cast, i.e. 1863: on the left trunnion is a letter "P" for "proved" which the inspector's initials, i.e. "W.R.T." for William Rogers Taylor. Prior to John Dahlgren's guns, which were cast and bored in the mid 1800's, crews felt the thrust of guns bursting while firing. It was almost as dangerous to shoot as to be shot at. No Dahlgrens were on the deck of the Hartford, The Hartfort was a steam sloop of war. Top speed was like the lake freighters of today, approximately 13 knots with both steam and sail being used. In 1864, Mobile, Alabama was the last important port of the Confederacy on the Gulf of Mexico. The Battle of Mobile Bay occurred in the lower part of the bay on the morning of August 5, 1854 between Union and Confederate warships. The Union fleet, commanded by Rear-Admiral David G. Farragut, included 14 wooden gunboats and 4 monitors. The Confederate fleet, commanded by Admiral Franklin Buchanan, consisted of three wooden gunboats and the Ironclad Tennessee. To engage the Confederates, the Union ships had to pass through the main shipping channel just a few hundred yards from the big guns of Fort Morgan. The Confederate troops drove wooden pilings into the bottom of the bay, narrowing the entrance. In the main shipping channel, they put underwater mines called "Torpedoes" made of whiskey barrels filled with gun powder. While Farragut and his ships were under fire from the fort, his leading gunboat struck a mine and sank. Farragut ordered his flagship, the U.S.S. Hartford, to lead the main column of ships across the mine fields. His famous order was reported to have been "Damn the torpedoes, full speed ahead." The U.S.S. Hartford was a steam sloop-of-war launched at the Boston Navy Yard on November 22, 1838 at a cost of $502,650. Originally, she had a battery of 13 guns with 302 men and officers: her overall length was 264 feet and her beam was 44 feet. After duty in the East Indies, she returned to the United States on December 2, 1861 to become the flagship of Rear-Admiral Farragut. After battles in New Orleans, port Hudson, Vicksburg, and Mobile, she was put out of commission on January 14, 1887 to be used as a training ship in the Pacific and Atlantic with Captain Percival Drayton at her helm. The list of casualties consisted of hit 20 times, 25 men killed and 28 wounded with no prisoners taken. In spite of all her glories in battle and in helping to bring the Civil War to an end, in November 20, 1956 she fisted to the port side and settled to the bottom of the Elizabeth River in Norfok Virginia, however, the memory of her service and devotion still lives on. As our guns (cannons) rest on our marina lawn, think of all the fierce battles that they went through for the freedom of our nation and its people. These cannons are memorials to all the fighting men and women who served our country. Farragut's words are appropriate, "The best gun and the best vessel should certainly be chosen, but the victory, three times out of four, depends upon those who fight them"
Our cannons are believed to have been moved here in the winter of 1904-05 from Mare Island Navy yard in California. Congressman George Loud and City of Petoskey's Postmaster at the time, James Buckley, are credited with obtaining these guns for Michigan. The cannons were probably moved here by railroad.